Happy last Monday of 2013! I'm counting down the days until the new year, only two more to go! Do you have any plans for tomorrow night? The days of going out on NYE are long gone for me! I'll probably be staying home with my little family and parents to watch the ball drop on TV. If you're doing anything exciting, I'd love to hear about so I could live vicariously through you! I have another exciting Nerdlacquer polish to show you today, and that's Alecto from her newest collection based after the Greek Furies. To see my previous post, please click here if you'd like to see Magaera. 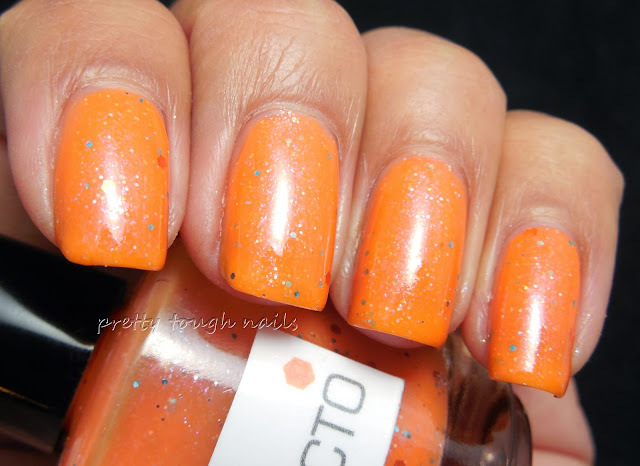 Alecto, known as "the implacable or unceasing anger" is a lovely orange that leans a bit creamsicle colored but not quite, and has a ton of iridescent flakes, a sprinkling of orange hex glitter, and gold microglitter to bring it all together. I used four coats here, although I could have gotten away with three coats IRL. I had no difficulty with the extra coats at all - the smooth NL formula was easy to apply and didn't drag or pull during application. In fact, I misjudged the consistency thinking it would thicker than it was and I accidentally loaded the brush with more polish thatn necessary which led to slight cuticle pooling on my pinky. Oops. I finished this with a layer of NYC GCS topcoat. I love the complex simplicity of this polish - there's a lot going on with the iridescent flakes and microglitter, but the larger random hexes give an illusion that there isn't a lot of components within the polish. How does she always do that?? Genius I say. I love the muted orange shade as well because it's not Halloween orange or fall orange, but an orange that is neutral for all season. Amanda, elusive as she is, says she will be back for good now so hopefully capturing one of these beauties will be much easier. Only time will tell! This is a fun, bright color! I think it would be perfect during summer. I love the little bits of glitter in it. Thank you! This was a bright mani that brought some sunshine to my day! I think this would make a great summer pedi!